1. It gives me great ideas for cooking meals for my vegetarian husband, Darrick. 2. The recipes are packed with flavor and often very quick to prepare! I had a jar of canned pumpkin in the pantry, so I decided to try the Pumpkin Quesedilla recipe. The pumpkin, green chilie, and cilantro filling was out of this world! I used fajita tortillas, which are six inches in diameter, and so I had enough filling to make two whole quesadillas! To keep the recipe vegetarian-friendly, I used chicken strip substitute. I had the Morningstar strips, but I also thought of cutting up one of the Quorn brand grilled "chicken" cutlets. They came out golden brown, and looking totally delicious, so I was tempted to stop there and dig in. 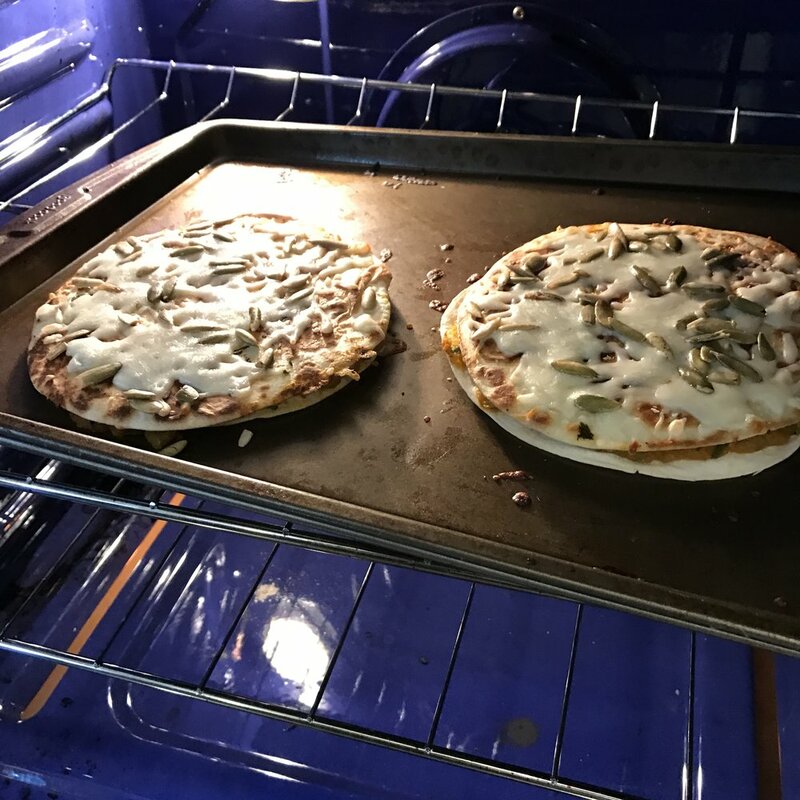 So I popped them into the oven covered in mozzarella cheese and pepitas to bake! Now I didn't have cherry tomatoes, so I substituted roasted red peppers. They lacked the zip of tomatoes, but added smokiness and a bit of color, so I think it worked! Out of the oven they looked good enough to devour immediately, but I restrained myself and let them cool ever-so-slightly so I didn't burn my tongue off! The recipe was a big hit! Just look at Darrick enjoying his Pumpkin Quesadilla lunch! Replacing some of the cheese with pumpkin still made this dish delicious and a little more balanced in the Calories Department, which is a department I like to keep in mind. Quick, delicious, and I ate my veggies! Toss the lettuce, tomatoes, lime juice, oil, and salt in a small bowl. Set aside while you make the quesadilla. Preheat the oven to 400°F. Place the chiles in a small bowl. Pat them gently with a paper towel to absorb some of the liquid. Add the pumpkin, cilantro, sriracha, and salt to the bowl and stir until combined. Lay one tortilla on a plate. Scatter half the cheddar over it and then spoon the chile mixture evenly over the cheese. Scatter the chicken and then the remaining cheddar over the chile mixture. Lay the second tortilla on top. Heat the oil in a large oven-safe skillet. Transfer the quesadilla to the skillet and cook until the bottom tortilla is brown on the underside and crisp—about 3 minutes. Flip the quesadilla over and cook the other side the same way—for 3 more minutes. Remove the skillet from the heat. Spread the mozzarella evenly over the quesadilla and sprinkle the pumpkin seeds on top. Place the skillet in the oven and cook until the mozzarella is melted and the seeds are lightly toasted—5 minutes. Top with the salad; cut into wedges and serve hot! I always have lots of cheese in my fridge, like LOTS, and for this recipe two types of cheese seemed nice and I liked the color difference. But you can easily use all cheddar instead of a mix. 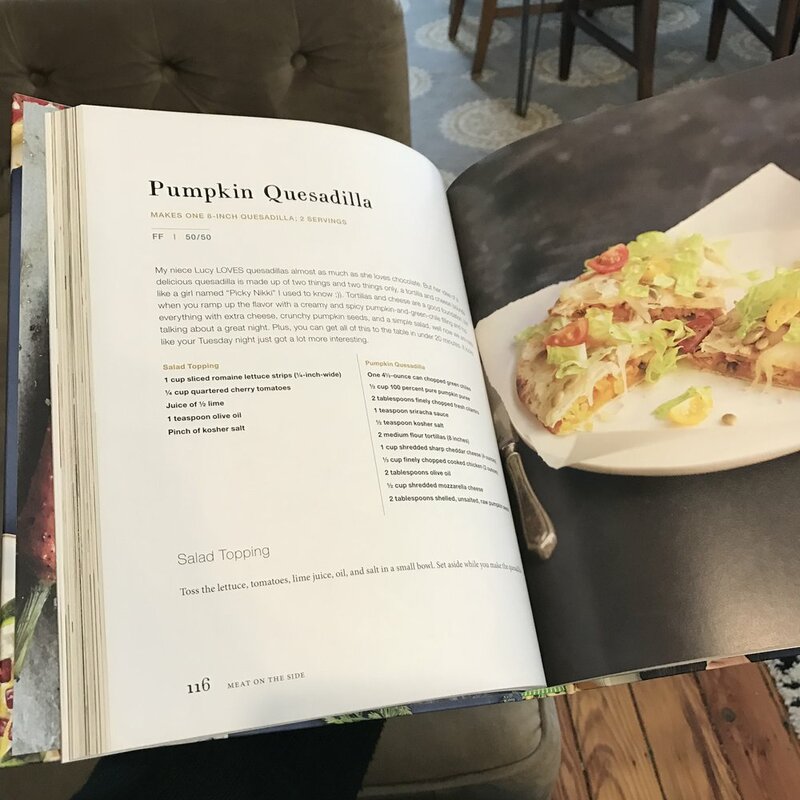 The seeds on top give such a great texture to the quesadilla, it’s my favorite part, and since you can almost always find pumpkin seeds, AKA pepitas, in the bulk section of your grocery store, you can get just the amount you need. Sriracha is a great hot sauce, but whatever variety is your favorite is perfect for this. I love having cooked chicken in the freezer, that way I always have 2 ounces worth ready to go for this quesadilla. Strictly speaking this doesn’t qualify as a 10-in-20 recipe—a few too many ingredients! But it comes together really quickly, making it the perfect lunch or easy dinner. With the pumpkin being the same color as the cheese this kind of just looks like a big cheese quesadilla that everyone is bound to love. You can also use a little extra cheese and a little less pumpkin. And though I love the seeds on top they can always be left off. 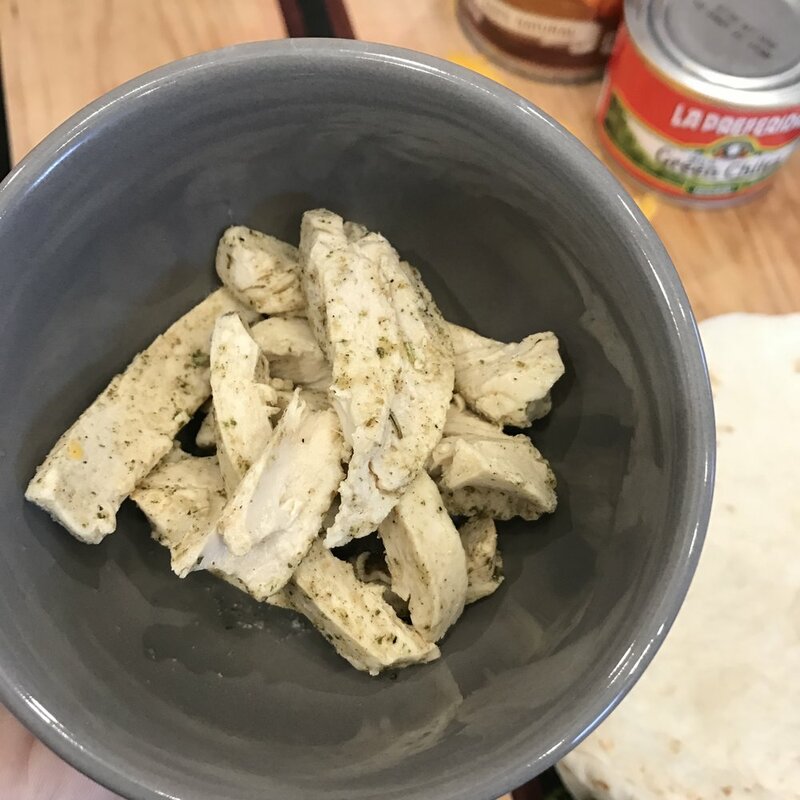 Sometimes I use just 1 ounce of cooked chicken for my husband’s side of the quesadilla and leave my side chicken-free for a great 50/50 meal.